It can be really hard to tell if we are serving ourselves and our families the right amount of food. We have seen the size of food packages explode over the last 20 years. 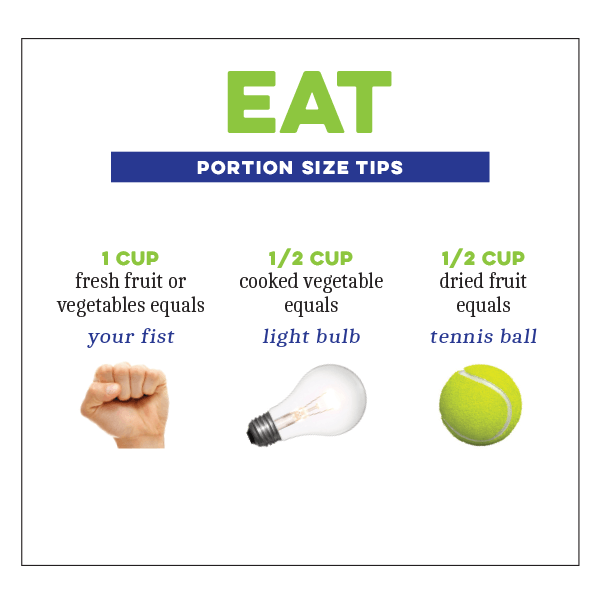 So how can we serve and eat smaller portions? First, it is important to understand the difference between the serving size and a portion. Portion is how much food you choose to eat at one time. Serving Size is the amount of food listed on a product’s Nutrition Facts Label. The values you see on the Nutrition Facts Label are for the serving the manufacturer suggested. To learn more about the Nutrition Facts Label be sure to check out our “Reading Food Labels” page. Your fist is about the size of a cup. The palm of your hand is about the size of 3 ounces of meat. Your thumb is the same size as 1 ounce of cheese. To control your portions, it’s best to put foods on a plate rather than eating directly out of the box or bag. This allows you to see how much you are eating. And as a general rule of thumb… A little less is usually plenty.